Nintendo has done it. They reached apex Mario Kart. After the critically acclaimed, must-have game that was Mario Kart 8 on Wii U, where else could they take the series? Apparently the answer is nowhere, because instead of a new iteration on the Nintendo Switch we have an incremental upgrade that includes all DLC and refines/beefs up the battle mode. Is it worth double-dipping? 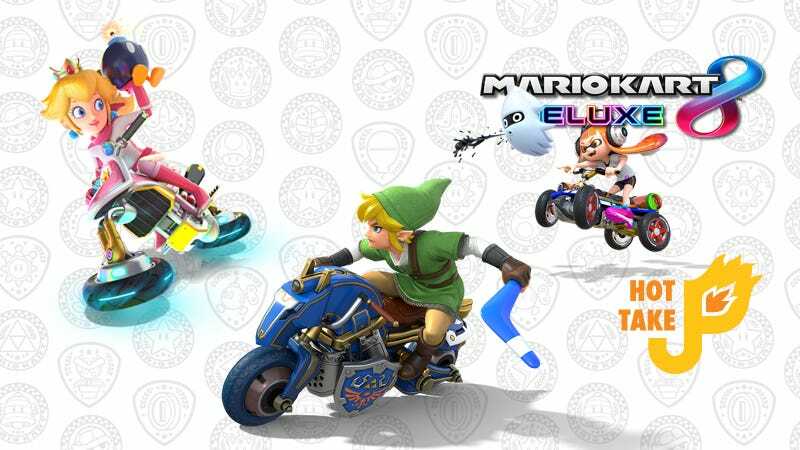 While Deluxe includes every course and mode available for racing from Wii U’s 8, it does nothing to change them. Which is fine. They are (mostly) perfect without any changes. Deluxe eschews the track-centric battle mode from the Wii U’s 8 and instead includes many classic battle stages from previous titles. We get a handful of new battle arenas that relate to race courses as well like Lunar Colony and Battle Stadium. Dragon Palace is one of the new battle mode arenas, along with all new battle modes to play. Adding the second item is an improvement, but don’t expect the change to save you from blue shells. Those are still present and still terrible. Visuals received some upgrades, but otherwise the game hasn’t changed. Music is the same; jazzy and fun. The multi-Switch play is great. My friends and I prepped for a Mario Kart 8 Deluxe competition at a local bar (I won btw) by setting up our switches at a table and racing. Four of us used tabletop mode with sideways joy-cons, while the fifth played in handheld mode. Mario Kart is where the Switch’s selling point shines. I only had two vodka & sodas and took home first prize; A Wii U that I promptly put on eBay. The inclusion of new characters like the Inklings (and Bowser Jr.) push the narrative that soon this will be Smash Kart. The Inklings kept all their personality when they sped their way onto the raceway. No more DLC has been announced. I’m calling that a bad thing because Nintendo might expect us to buy a Mario Kart 9 for Switch whenever they want to release that. The game, as I’ve said, is at it’s apex. Mechanically there isn’t much growth to be made. The same can be said for visual and sound design. The only way I can see it improved is by providing more characters and stages through DLC. Mario Kart 8 Deluxe did two things: Solidified it as the greatest version of Mario Kart possible, and made the case for the Switch’s portable multiplayer. If you played the original and aren’t interested in the new multiplayer-focused modes then I say definitely don’t buy the game twice. For those who skipped the Wii U or want a new way to play Mario Kart with friends its a must buy.